Airports across the country are scrambling to adjust to growing discontent among the federal employees that work at them, including increased no-shows and protests inside the terminals. 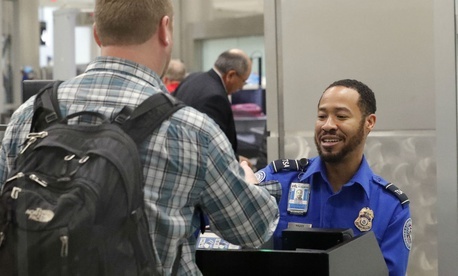 Call outs among Transportation Security Administration employees have jumped in recent days, as most workers affected by the ongoing partial government shutdown have now officially missed a paycheck for the first time. That increase has caused several airports to close terminals and redirect travelers through consolidated security checkpoints. TSA has conceded that call outs have spiked but stressed that it has not compromised safety in any way. Houston's George Bush Intercontinental Airport, Miami International Airport, Washington Dulles International Airport and Hartsfield-Jackson Atlanta International Airport are among those that have announced changes. Reports of a higher-than-normal rate of TSA employees calling in sick during the shutdown began surfacing early last week, but actual, on-the-ground impacts were minimal at that time, according to daily updates from the agency. That has changed in recent days. On Saturday, 5.6 percent of TSA employees scheduled to work called out, according to Michael Bilello, a TSA spokesman, compared to 3.3 percent on the Saturday one year prior. By Monday, that climbed to a 7.6 percent rate of unscheduled absences, compared to 3.2 percent on Monday, Jan. 15, 2018. At Dulles, located in Virginia outside of Washington, D.C., the call outs were exacerbated by a snowstorm that dumped eight to 12 inches throughout the area and caused federal offices in the region to close—though TSA said the unscheduled absences exceeded a normal post-snowstorm day. That led TSA on Monday to announce it would "consolidate checkpoints today for more efficient screening operations." As it has in each such instance, TSA noted, "Security standards remain in place and have not been compromised." TSA announced on Monday it would begin relocating screeners to different airports around the country when shortages arise. The national reallocation of officers would ensure TSA at each airport can "meet staffing shortages that cannot be addressed locally," Bilello said. Travelers at U.S. airports may also soon see shutdown activity from the Federal Aviation Administration’s workforce. The National Air Traffic Controllers Association has organized a leafleting campaign at 50 airports across the country, starting on Monday. Some FAA employees have been furloughed, while air traffic controllers remain on the job without pay. They are hoping to raise awareness about their own plight, as well as the potential dangers to the National Airspace System during a shutdown. “No one should be under the illusion that it's business as usual for aviation safety during the shutdown,” NATCA wrote in the pamphlet. “Every day the shutdown continues, the negative consequences to the NAS and its employees are compounding." The leaflet notes that workgroups are unable to meet, maintenance is being delayed, training and hiring have been halted and modernization efforts have ceased. In a statement last week, FAA thanked employees for working to “keep the traveling public and our skies safe.” It added the agency is allocating resources based on risk assessments and will recall inspectors and engineers if any issues should arise. McCabe said FAA management has not made any comment to employees about their leafleting efforts, and the agency did not respond to an inquiry from Government Executive. At TSA, Administrator David Pekoske has made overtures to his workforce—both in words and in action. The administrator has used special authorities to ensure employees who worked on Saturday, Dec. 22, the first day of the shutdown, were compensated for that day. He has also provided a $500 bonus to every uniformed TSA screening worker “in recognition of their hard work during yet another busy holiday travel season.” He said he recognized that it was not what the workers were owed, but he hoped it would “alleviate some of the financial hardship” many TSA employees are facing. This story was updated with additional details on TSA's shutdown plans.